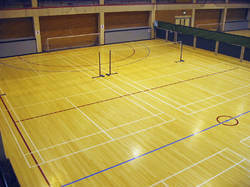 We are a leading Manufacturer of indoor sports pu flooring, indoor sports vinyl flooring, oes outdoor sports flooring, indoor wooden sports flooring and rubber flooring from New Delhi, India. 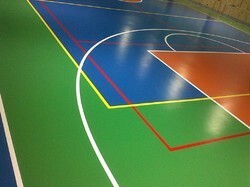 OES Outdoor Sports Floor is made up of hard surface and elastic interior. It features good shock resistance and rebound resilience which makes it a superlative choice. 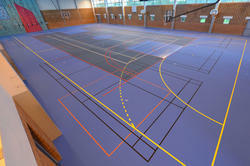 Because of the stable friction coefficients, thefloor can buffer the motion impact hence avoiding injury for athletes during warm-up sessions or final heat.Mentioned features make OESoutdoor Sports floor as one of the best choice for professional sports area. 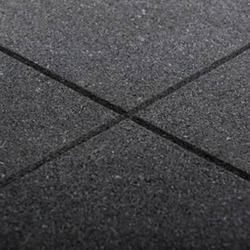 We are offering you high quality and water resistance EPDM / Rubber Based Flooring . We used tiles while manufacturing to maintain its properties over high temperature. The dual durometer manufacturing process combines the resilience of a low density base mat with the resistance of a high density wear coat. 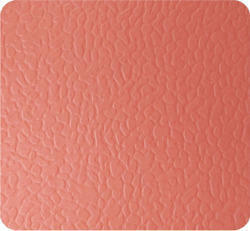 It is durable and available in reasonable price. Features: Water resistance Well analyzed Durable. Combination of various colors gives beautiful looks… And many more!